With the strokes of his brush, Mr. Ong paints this pair of canvas with his signature Tiger Camo, heavily inspired by the punk rock genre and military motifs he discovered during his youth in the ‘80s and ‘90s living in Singapore. In polarity to the perceived restrictive lifestyle of Singapore, the energy manifested in the horror punk band Misfits and the premise of human individuality in American culture aligned with his own enthusiasm for freedom of expression. The imagery symbolized self-spirit, power, ultimate freedom of having no boundaries, and Mr. Ong carries this ideology into every artwork he creates. 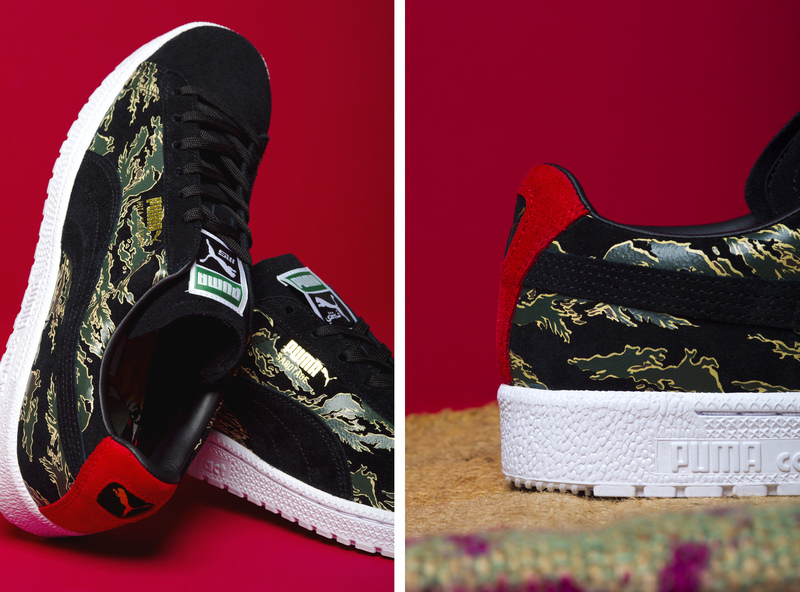 Puma Clyde “First Contact” is based off of a custom sneaker painted in celebration of Mr. Ong’s first experience of Japanese culture and hospitality during his trip to Miyazaki, suitably the name “First Contact.” It is a modified version of the classic Clyde with a contact sole unit sporting leather-lined suede construction and his signature tiger camouflage. Although similar in punk rock and military theme, the intricacy of the camouflage pattern hand-painted on this pair stands out among all his custom sneakers. The strokes around the pattern are much thinner, like the veins of a leaf, and are in gold over black suede canvas. 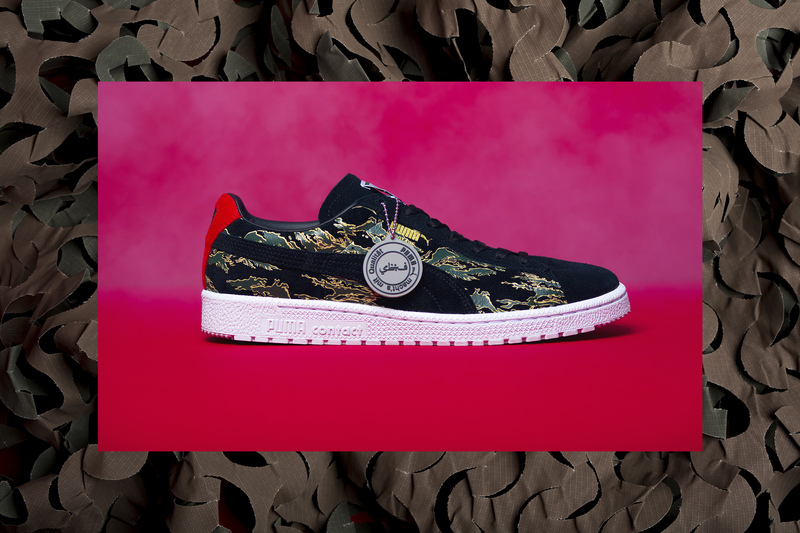 The camouflage pattern itself branches off in multiple directions and ends with a splash of red accent in the heel tab. The delicate treatment of the pattern embodies a polish and attentiveness that subtly reminisces Japanese culture and alludes to traditional Japanese calligraphy and painting. Yet, in this case, delicacy doesn’t equate to softness. The vibrant colors of gold, red, black, and green, and the directness of the line work, strikes as bold and impelling. Perhaps the juxtaposition between delicate and bold — like Japanese and American culture — is what parallels the spirit of rebellion and uniqueness of SBTG. Owning customized footwear like the individually hand-painted “First Contact” sneaker is an investment in the artist. Understanding his way of the living, his messages behind the artwork on a unique canvas, and his legacy as one of the pioneers of the punk rock subculture in Singapore elevates a one-of-a kind design to another level of beauty and appreciation that may relate to you. 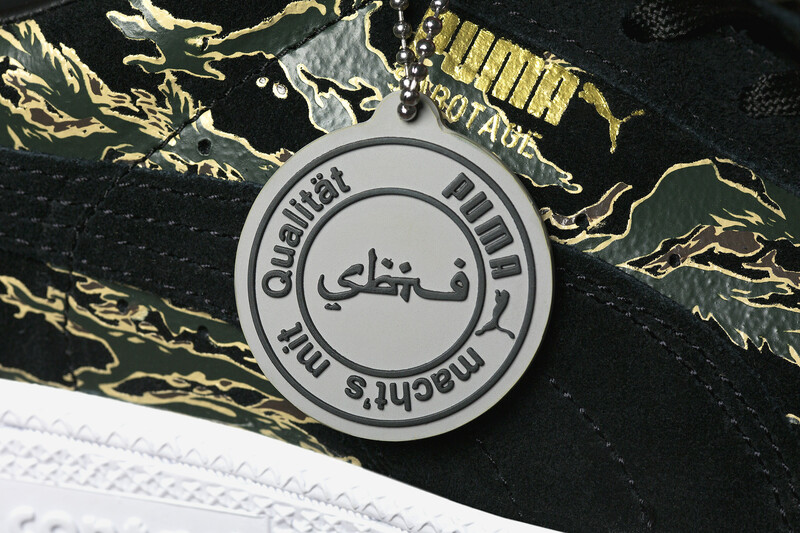 The subtle allusion to his first trip to Japan and his influence in the custom insoles featuring Mita’s signature chain link fence and a self-caricature holding an olive green flag with the symbol of Miyazaki Prefecture speaks for itself that these custom shoes are about the story behind the art and the artist. And context is key in an investment piece. The moment you truly connect to the SBTG’s philosophy and story, “First Contact” evolves into an investment piece that will stand the test of time, and those sneakers will never be the same.